So you’ve come to Florence, the home of the Renaissance, Michelangelo’s David and of course, leather. Back in the days before online shopping, people used to flock to Florence in search of the perfect leather goods to bring home to family and friends. Why? Because locally manufactured leather can be higher quality and more reasonably priced than most other places. Whether it’s a stylish leather jacket, purse, wallet or belt, you simply must treat yourself to an authentic Florence leather good. When in Florence, right? 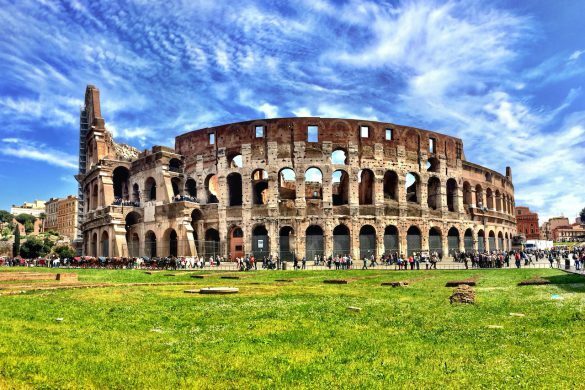 Though Florence is a walkable city in which most attractions are not too far apart, it’s easy to not take full advantage of the charming Renaissance city. 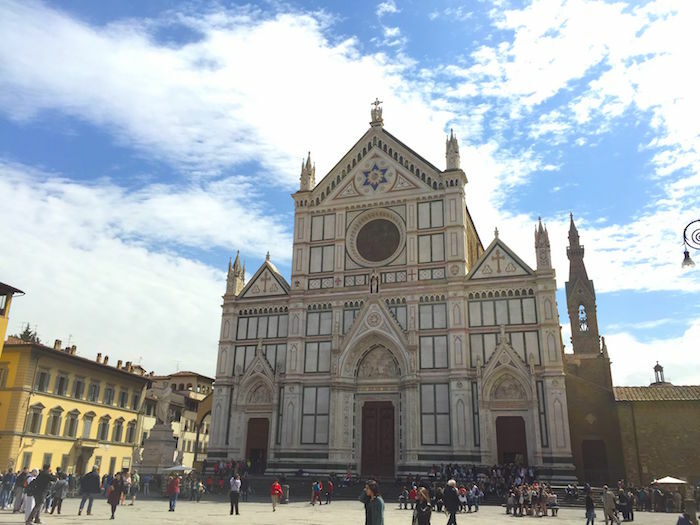 To learn about Florentine leather, we recommend our Half Day Florence Walking Tour. 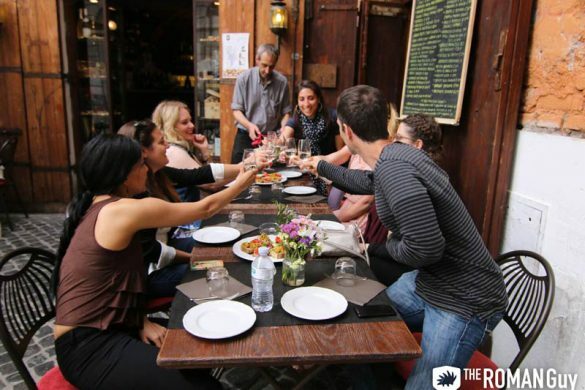 For more variety, check out the rest of our Florence tours. All of our experience offer skip the line access and insight from a professional local guide. The art of leather-making began in Florence right along the Arno River where many tanneries and dye shops were set up for easy access to the water necessary for the leather-making process. But how did these artists and craftsman learn to create such beautiful leather goods? The famous Scuola del Cuoio or School of Leather was created after WWII as a way to give orphans of war the means to learn a great trade for which they could earn a living. The school is located on the beautiful grounds of the Monastery of Santa Croce. 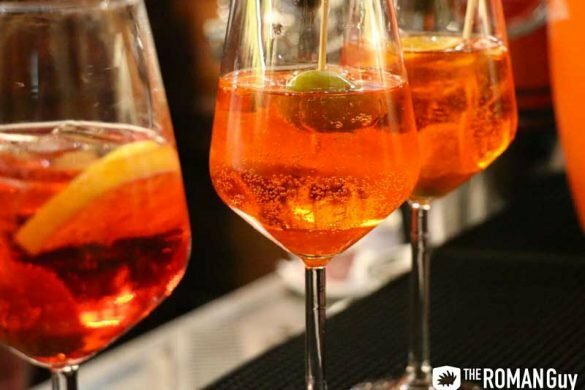 Today, you can visit the Scuola del Cuoio for workshops and shopping. You may even see a craftsman hand-stitching a wallet as you peruse. Before purchasing leather there are a few questions you need answered. Was the item made with authentic Italian Leather or was it simply made in Italy. There is a difference between the two. A tag that says “Made in Italy” does not guarantee that the item was made with Italian leather, rather it could be faux leather manufactured in Italy. 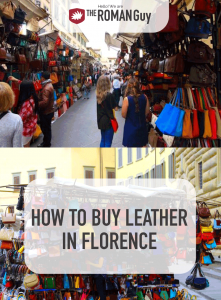 You’re probably wondering where to buy leather in Florence. As Florence is the leather capital of the world, there are plenty of options to choose from, but here are a few to get you started: The Leather School, San Lorenzo Market and Massimo Leather. And for those looking to buck up for designer leather, we recommend Florence’s finest: Gucci. Located right outside of Mercato Centrale, The Mercato di San Lorenzo or San Lorenzo Market is a must if you are hunting for the perfect leather bag or jacket. With hundreds of stalls and thousands of leather goods to choose from, it can be a bit overwhelming, but have no fear. The market is home to vendors selling items from €2 bracelets to €500 leather jackets. Take a relaxing stroll through the stands and keep your eyes peeled. It is likely that you’ll see many purses or jackets that get your attention, but don’t jump in and pay the price on the tag right away. Keep looking through the different stalls, and if you see something similar to an item that caught your eye earlier, check the price to compare. 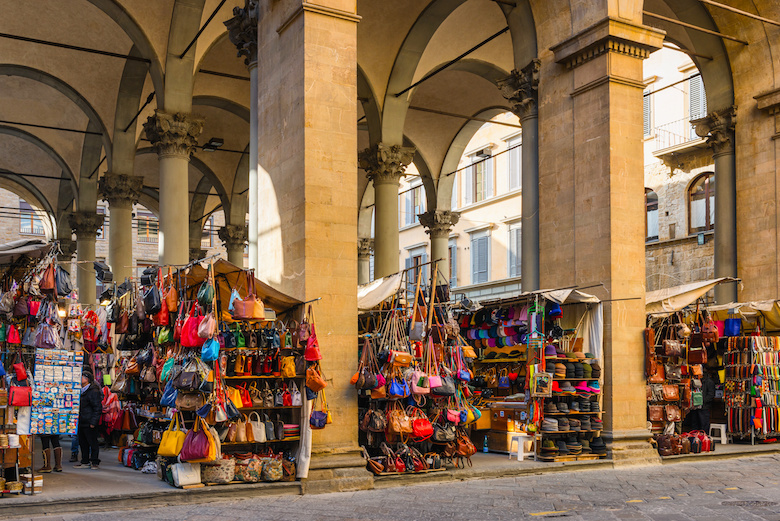 This leather market is located on Via Calimala, the road that directly leads to the Ponte Vecchio. 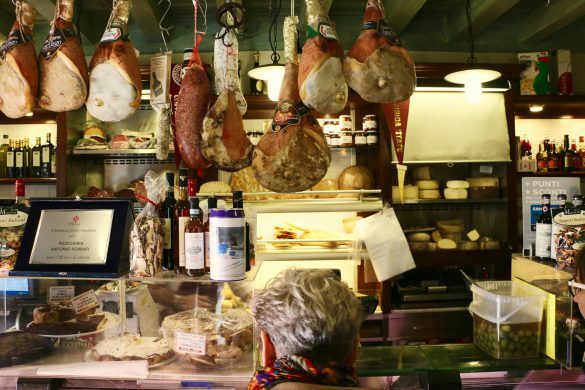 The market is defined by a it’s classic Fonatana del Porcellino, a fountain characterized by a sculpture of a boar. 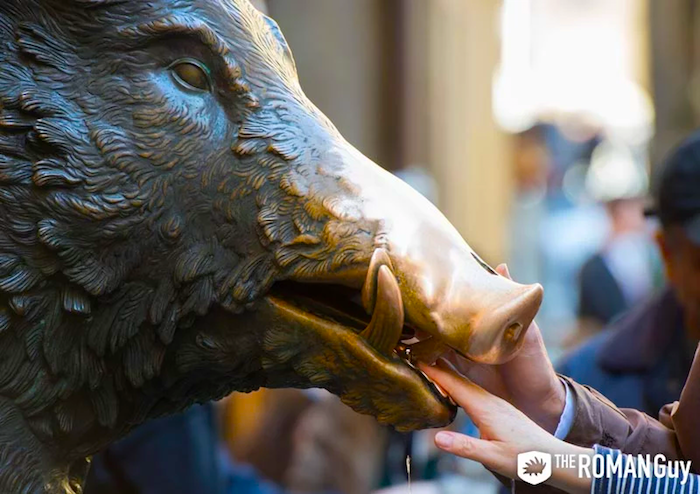 You’ll pass by this on our Half Day Florence Walking Tour, and your guide will encourage you to try to throw a coin into the boar’s mouth for good luck. Just like in the San Lorenzo Market, the items are often marked up quite a bit, so don’t be afraid to negotiate with the vendor. If you fall in love with an item but they don’t have your size or color in the stall, ask the vendor. Many vendors have small warehouses close by that they’ll either run to to check for you or maybe even invite you to visit and show off their collection. Before buying an item, make sure that it is the real Italian leather quality that you’re expecting. 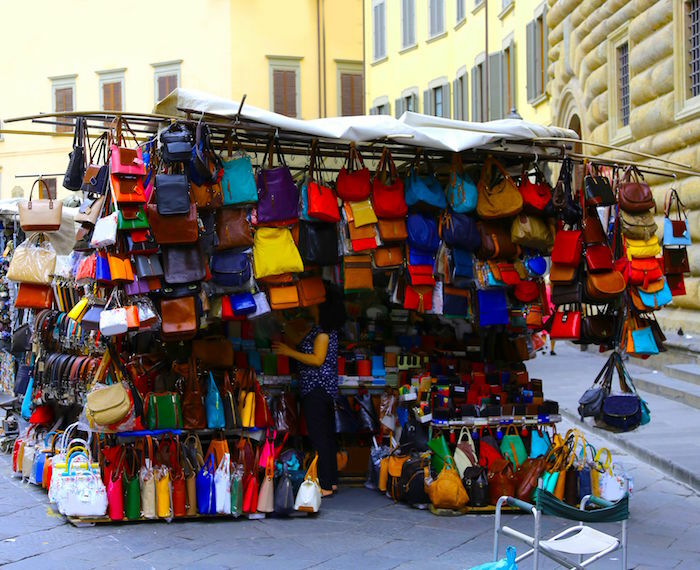 Located very close to the San Lorenzo Market is a crowd favorite as far as Florence leather vendors go. Massimo Leather has been in the biz for over 20 years, providing high quality leather products to their customers. Massimo’s goods are high in quality and reasonably prices. Just asked Massimo himself, owner of the store, if you need any assistance in selecting the best products to bring hime. The store will also alter your leather goods for you if you need to adjust the sizing. 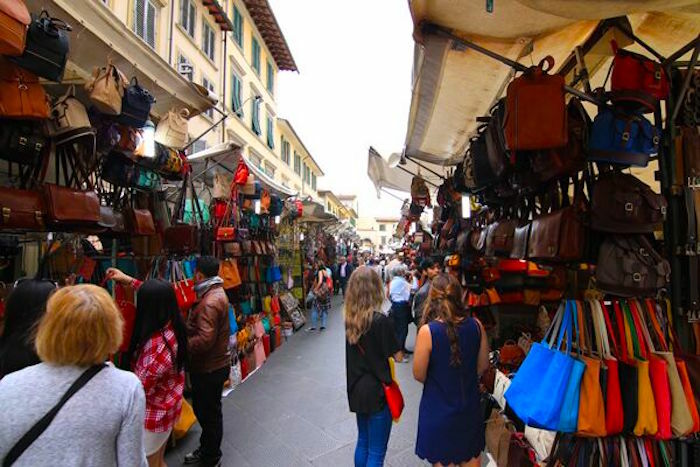 The Scuola del Cuoio, as mentioned above, is the most genuine place to buy leather in Florence, located in the Monastery of the Basilica of Santa Croce. All of the goods are made directly on site by trained leather engineers. Many organizations worldwide actually import their leather from the Scuola, ranging from the Italian Airforce to the Ritz Carlton in Paris. Because of the School’s authenticity and fine craftsmanship, the leather here can become a bit pricy. Yet, buying leather from the Leather School in Florence means extremely high quality products from highly-trained professionals. If you’re looking for a true Florentine name brand, Gucci is as Florentine as it gets. Gucci started as a leather company in Florence in 1921 supplying luxury leather goods for for horseback riding. Today Gucci stores can be found all over the world but the Gucci Garden and Gucci Museum are at home in Florence. 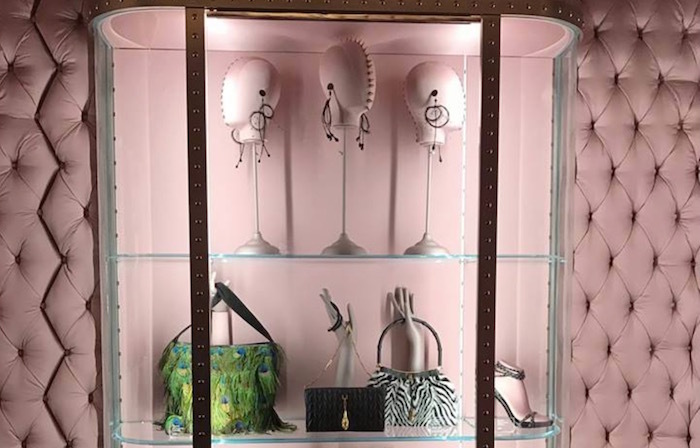 Inside you can see the permanent Gucci collection exhibiting leather goods, clothing and jewelry from throughout the history of Gucci. You can visit the Museum at Piazza della Signoria 10, Florence, Italy from 10:00am to 8:00pm.